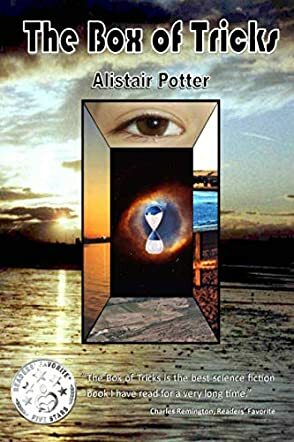 Alistair Potter writes Fantasy, Science Fiction, short stories and poetry. His work has been read on the BBC Radio4, Scottish Shorts series, and he is former recipient of a Scottish Arts Council New Writer's Bursary. The Box of Tricks first saw light at a Lumb Bank writing course run by the Arvon Foundation in the UK. The course tutor, Lisa Tuttle, came back late from the lunch break, having become so engrossed in the first few chapters she'd lost track of the time. It was a good indicator that I should keep going! A few years have passed since then, and a few revisions, including a US version based in California, which sadly was lost to a hard drive crash (always back-up in multiple locations!). I'm pleased with how it turned out as the 'Edinburgh' version, and if you choose to read it, I hope you enjoy it. Tom Mathers is a fairly typical British hero, rather shy, tongue-tied around attractive women, but stout-hearted, loyal, brave and always determined to do the right thing. The Box Of Tricks by Alistair Potter chronicles his adventures resulting from his inheritance of a small antique box from his Uncle Jim. Following the instructions contained in a brief accompanying note, he is catapulted into another dimension and invited by a somewhat shady character to continue with his uncle’s past employment of collecting random objects which have been misrouted during transport, and returning them to their correct world or location within the multiverse. After a little hesitation, Tom accepts the challenge and, following some routine but quite exciting tasks, things start to get a little more complicated. Receiving an assignment to track down and transfer a person as opposed to an object, he is rapidly out of his depth until he meets and subsequently teams up with a fellow collector, the gung-ho, swashbuckling James Fanshaw. Aided and sometimes inhibited by the hugely attractive Susie, who Tom finds almost impossible to talk to, and Lady Caroline Lamb (the original) with whom James had once shared his life, they charge through the planets and dimensions of the multiverse in a series of adventures which culminate in their dramatic attempt to put an end to the tampering and misuse of time itself by an ancient race. The Box Of Tricks is the best science fiction book I have read for a very long time. It reminded me very much of the works of the late Douglas Adams. Well-structured in short punchy sections, the narrative moves along at a brisk pace, taking us through a series of strange but believable planets and thrilling encounters. Alistair Potter writes with a light hand, the plot contains a serious message but no point is laboured and there is a good deal of humour along the way. I strongly recommend this book, written in the best tradition of British science fiction, and urge you to read it. Personally, I will be sampling more of Mr Potter’s published works very soon. Earth is in trouble. Eco disaster awaits, and our days are numbered unless somebody can intervene to save us. Is mild mannered Edinburgh taxi driver Tom Mathers enough? He'd better be, because he's our best bet in The Box of Tricks by Alistair Potter. Mathers is devastated by his uncle's sudden death from a stroke until he claims a curious object from the estate: a card that transports Tom to an alternate world where he's offered a job as a "collector." It seems simple enough: retrieve objects and return them to their proper universe. The complications arise when it goes from retrieving objects to retrieving people - and other things with more dire, sinister implications. Chance encounters with other collectors open Tom's eyes not only to the fact that the universe is bigger than he realized, but that Earth has a significant part to play in how it continues to function. I thoroughly enjoyed The Box of Tricks. While the concept of alternate universes isn't new, Alistair Potter gives it a spin that makes this world unique, even to regular readers of sci-fi. This new take on an old concept gives a breath of fresh air to the sci-fi genre by taking us from the dystopian views of Earth to a wider perspective of the universe and of life. The plot has some slow parts, but they fit in to provide the perfect pace to this larger tale that could potentially become complicated if you aren't paying attention. It's filled with honest characters that you'll like, and adventure that you'll find fascinating and thrilling. All in all, this is a great sci-fi book, and I highly recommend it. In The Box of Tricks, Alistair Potter's tale of fast paced science fiction/action adventure, Tom Mathers is a mild mannered taxi driver who discovers that he has inherited a curious mix of items from his recently deceased uncle. One of the most unique items is a simple grey card that a letter from his uncle promises will give him the adventure of a lifetime. Touching the card transports him to another world where he finds out that his uncle was a sort of intergalactic item retriever, returning objects that become misplaced as they are transported between planets. Accepting his uncle's role transforms Tom's life in ways that he never could imagine. With a unique cast of characters, a driving narrative filled with action, not to mention a few double and triple crosses in space, The Box of Tricks will keep readers on their toes! With an underlying environmentalist theme, The Box of Tricks by Alistair Potter sees Tom grow from a mild-mannered, shrinking violet to a self assured, if occasionally bumbling, planetary traveler and hero. I really enjoyed reading The Box of Tricks. It's a unique, unexpected read, with a sort of dry humor liberally dispersed throughout the action. While I did wish that the world building was a little more diverse (most of the planets seemed very similar), The Box of Tricks gave me a distinct Hitchhiker's Guide to the Galaxy vibe that I really liked. A light science fiction read that works as a great introduction to the genre and Potter's work at large. Alistair Potter’s The Box of Tricks begins with Tom Mathers opening a parcel bequeathed to him by his uncle. The package contains only a toy gun, a credit card sized piece of plastic, and a note from his uncle, or so Tom thinks. But the gun is not a toy, nor the plastic bit just plastic. The card is a communication device that allows Tom to speak with a man named Cobb, who happens to be in the freelance collection business. He tells Tom he is from another planet, and enlists the incredulous young man as one of his collectors. When he received an assignment, Tom is to take the gun, find the item, and fire the gun at it. It's not really a gun, but a transport device for the target item. Tom joins the league of interplanetary collectors, and things go smoothly for him until he's asked to 'collect’ a living being. He finally begins to get suspicious, which leads him to more collectors, where he learns they are normally paid in time, not money. Time which can be cashed in for money, or used for things like de-aging oneself. He takes up with James Fanshawe, a long-term collector. This works out quite well for both until the day a collection goes very, very wrong. Illegal cargo is brought back, putting them both in grave danger, and that's the least of their worries. During their flight from FED agents, they stumble onto a terrible secret, one that will change the Federation forever. Alistair Potter’s The Box of Tricks is a hilarious, yet sobering journey through the multiverse. There are deep philosophical questions hidden beneath a veneer of joviality and witty sarcasm. Questions of ethics, resource management, and caring for our planet. I cannot recommend this book enough. It was an enjoyable, engaging read. I love the witty humour, but then, I'm partial to British writers. This book is what you would get if you mixed Warehouse 13 with Hitchhikers Guide to the Galaxy, and tossed in a pinch of Section 31 from Star Trek. This was a fresh take on 'aliens’ for me. If I understood correctly, the Federation is composed of parallel versions of our solar system. Planets are given a Zodiac designation, along with a numeric one. Our Earth is Leo-IX. There are several Earths, some in better shape than others. Travel between planets is actually by jumping or teleporting from one to the other. I don't want to give the big surprise away, but Potter does toss in some pretty heavy questions about the moral and ethical use of resources, and one possibility of us not being proper custodians of the planet we call home. There are several planets that are on the verge of collapse, and others whose resources have been squandered. They are dead planets, mere husks of their former glory. There's a lesson here, a warning to all of us to treat our planet properly, and tend her with loving care.